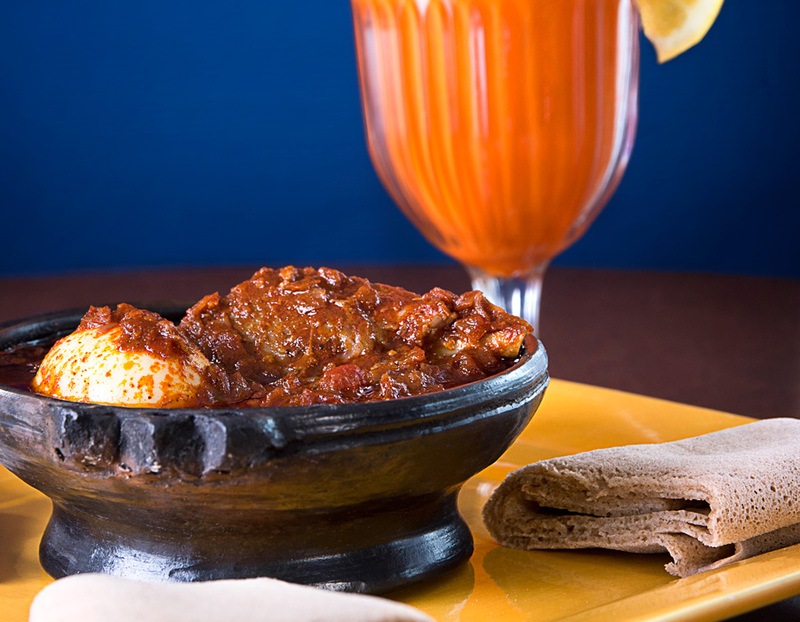 If you’ve never tried Ethiopian food, you’ve been missing out on one of Africa’s most interesting cuisines. Fortunately, you can remedy that by visiting the Queen of Sheba Restaurant on State Boulevard. Owned by friends Saba Marcos and Senait Gonfa, the restaurant opened last year in a small strip mall near Parkview Hospital. The restaurant is decorated in the greens, red and yellows of the Ethiopian flag, with musical instruments and other cultural artifacts on the walls. But what hits you when you walk in is the smell: an enticing aroma of roasting coffee beans and warm ginger and garlic. All three form the basis of the cuisine at Queen of Sheba, Marcos said. Ethiopian cuisine is very centered on vegetables, with collard greens, lentils, peppers and cabbage in many dishes. Meats play a guest-starring role, with lamb, beef and chicken the primary sources of animal-based protein. Nearly every Ethiopian dish is shared communally, placed on large round chargers that are covered with the ubiquitous injera, a flat, spongy bread that forms a “plate” on which piles of vegetables, lentils and meat are placed, to be shared with family and friends. Food is picked up and eaten with pieces of injera instead of silverware. Perhaps the best way for a person new to Ethiopian food to sample the flavors that make the cuisine for interesting is by ordering a combination meal and sharing with a dining companion, as is the tradition in Ethiopian households. The restaurant also serves freshly made fruit and vegetable juices, including spinach, carrot and strawberry juices. Customers can also order Ezekiel soup, made with 16 kinds of grains and beans, or Ezekiel bread, also made with a variety of grains. Loaves of Ezekiel bread are also available. Marcos and Gonfa met via their husbands, who came to Fort Wayne to study for the ministry at Concordia Theological Seminary. Gonfa, who is from Ethiopia’s capital of Addis Ababa, would cook meals for her husband’s fellow seminarians, who encouraged her to share her foods and culture with the wider Fort Wayne area. About that coffee: it plays a central role in the lives of Ethiopia’s women. Three times a day, women will gather at friends’ and neighbors’ houses to sip coffee and talk, Marcos said. Queen of Sheba’s coffee ceremony should not be missed. Marcos takes raw coffee beans and roasts them in a dry iron pan over an open flame. The scent of the roasting beans mixes with frankincense incense, which she burns at the same time and which combines with the coffee to create an intoxicating aroma. Once the beans are roasted a dark brown, she grinds the beans and steeps them in an earthenware pot. The coffee is served in demitasse-sized cups, with honey or sugar to sweeten. The coffee, though strong, is smooth and delicious. “Coffee is a time to share our news,” Gonfa said. Marcos, who does the cooking in addition to the coffee ceremony, said she learned the dishes from her mother, who wrote several cookbooks on Ethiopian foods.